Pitch adjustment is often necessary if the piano has not been tuned at least once a year, or has been moved. There is quite a lot of tension on all the wires in the piano. That’s why it needs a heavy frame to keep it in tune. 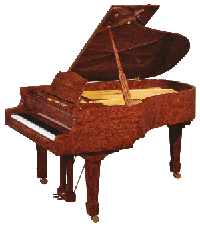 If the piano hasn’t been tuned regularly, it has to have a “pitch raise” or adjustment so the tension is reestablished on the frame (called the “plate”). If this is not done, the process will make all the wires unstable and a fine tuning can’t be achieved. The piano has to be very close to the target before a fine tuning will hold..
Give me a call before you purchase. I can offer advice and insight into the many brands available. Be aware that brands names are traded often, and most of the famous name pianos are now made overseas. This doesn’t necessarily mean they are not good pianos. In fact, many of the pianos produced overseas in China and Korea are better than when produced under that name in the United States. If you are considering a used piano, be aware that problems may lurk inside. Be sure to call me about a piano you may be considering. There are bargains out there, but don’t buy somebody else’s problems. Before you purchase a piano, make sure you have it inspected for potential problems. I don't get involved with price negotiation, but I will give you an honest opinion of the piano and its value. Give me a call and we can arrange to meet at the seller's location. Adjusting the tone of the piano is called voicing. Voicing is individual for every piano. If you compare pianos side-by-side in a store, you can hear differences in the tone. For example, a Yamaha piano is usually bright sounding. The pianos built in Japan and other Oriental countries are often made with a bright sound. European and American pianos are made with a more mellow sound. To a certain extent, this brightness or mellowness can be changed. Softening the piano hammers by poking them with needles will soften the sound, and adding stiffeners to the hammer felt will make them sound brighter. Think of hitting a nail with a claw hammer. It has a very strident sound. Then imagine hitting a tennis ball with a racquet. The sound is a lot different. Which one is preferable is a matter of personal taste and what one is used to hearing or playing Sometimes a piano will have stronger or weaker notes across the keyboard. Some notes may be brighter or softer sounding, and so the job of the voicer is to even out the tone. Experience is the key to voicing properly, since it is possible to go too far and ruin the piano hammers. Regulating a piano simply means adjusting the action so that it performs to its potential. Thousands of tiny parts and fine clearances must be adjusted to make it work properly. 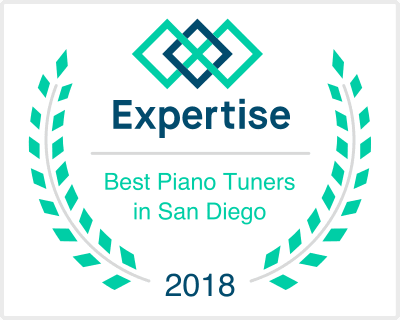 Because most of the piano is made of organic materials like wood, felt and leather, over time the piano will need periodic adjustments to maintain good playing condition. If your piano is ten years old or more, it probably needs some kind of regulation. Pianos tend to accumulate dirt and dust over time. The strings may begin to rust and become discolored. The finish may need cleaning and polishing, along with brass pedals and other hardware. With many sensitive parts in the piano, doing a thorough cleaning by yourself may not be a good idea. Bringing your piano back to showroom condition may require more than a simple vacuuming, so be sure to ask about our cleaning services. It probably won't cost as much as you think! When your piano is damaged, I can usually repair it. Sometimes parts aren’t available, so they have to be re manufactured. I can help. I can also do furniture repairs, and I do touch-up on almost any finish. I do not do refinishing, which involves stripping off the old finish and building it back up again. This is beyond my capabilities, but I can recommend several re-finishers if needed. Again, visit my Referrals page for more information.